If you think that your metabolism works simply by eating less and doing more, although that is partly true, it’s not that simple. Your metabolism can be determined by a number of factors and can be influenced by a number of factors, too. For every action there is an equal reaction when it comes to your metabolism. Do you know what’s truth and what’s myth? 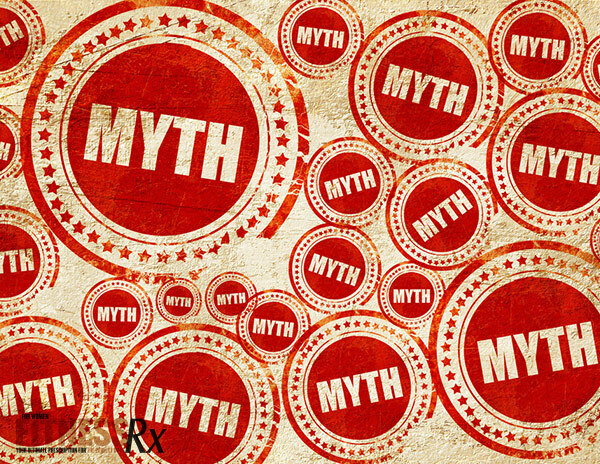 Here are four metabolic myths and what you can do about them. While these two processes are opposite, and require opposite hormonal pathways, it doesn’t mean that they can only happen in isolation of one another. Hormones involved in muscle growth include insulin, testosterone and even estrogen and progesterone to some extent, while hormones that help accelerate fat burning include norepinephrine glucagon, and adiponectin to name a few. However, that being said, testosterone, estrogen and progesterone can also play significant roles in your metabolism, controlling fat-burning processes as well. So what is the answer? It’s not necessary to only focus on trying to lose weight, or only trying to build muscle. A recent study showed that it is possible to achieve both and quickly! Research showed that those on a low-calorie, high-protein diet plus an intense weight lifting program not only retained but also gained muscle— about 2.5 pounds, while also losing body fat! The lower protein group didn’t add muscle, but managed to maintain their muscle by simply lifting weights. The high-protein group lost 10.5 pounds, while the low-protein group lost eight pounds. The extreme workout program got all participants stronger, fitter and improved body composition! Wrong, although it is true that you must eat less if you want to lose weight, what you eat will determine exactly what you end up looking like. A diet that is higher in protein, lower in carbs and provides a moderate amount of fat will ultimately slim down the body, but will also help to maintain and build muscle, and can even impact your metabolic processes. It has been suggested that a high-protein diet is involved in appetite regulation of satiety hormones as well as increased thermic effect of food and protein induced alterations in blood glucose regulation, which can improve metabolic outcomes. A recent meta-analysis showed that the thermic effect of food increases seven calories for every 1,000 calories of food consumed for each 10 percent increase in protein intake. Therefore, if you consume a 2,000-calorie diet with 30 percent of calories from protein, then the thermic effect of the food will be 13 calories per day higher than if protein contributes only 20 percent of the dietary energy! Another study showed subjects that consumed a 29 percent protein diet, had a 213 higher resting metabolic rate than subjects consuming the same caloric diet with only 11 percent energy from protein. While the processes are the same, everyone’s metabolism is unique and dependent on a number of factors, including your age, your genetics and even your body composition. And what’s more, being a woman! Women have slower metabolisms than men, we also have less active fat burning receptors in the body, and as our hormones change throughout the course of our life this can also have an impact on our metabolism specifically during and after pregnancy and during and after menopause. The best defense: keep eating healthy and working out. Following a fresh, wholesome diet and working out or being active regularly will help prevent metabolic slow down and fat weight gain as you age. Nope, there are literally hundreds of hormones in the body that trigger cascades of pathways that influence metabolism including your appetite, your ability to put on muscle, your stress response, and even the amount of sleep you get, which all can have an impact on your metabolism in one way or another. What can you do about it? Don’t stop working out or eating right. Living a healthy lifestyle will ultimately contribute to a healthy metabolic rate that will last a lifetime. Eat a high-protein diet that is lower in carbohydrates and full of plenty of fresh fruits and vegetables that provide natural sources of vitamins, minerals and phytonutrients that can help us stay healthy and keep our metabolisms firing optimally! In addition, following a workout that is focused on building and maintaining a healthy amount of lean muscle will also contribute to a healthy metabolic rate. And don’t forget to sleep and de-stress! Regular sleep of at least eight hours per night, along with a de-stressing ritual like yoga or meditation can help lower cortisol levels, and keep your hormones balanced! Longland TM, Oikawa SY, Mitchell CS, Devries MC, Phillips SM. Higher compared with lower dietary protein during an energy deficit combined with intense exercise promotes greater lean mass gain and fat mass loss: a randomized trial. Am J Clin Nutr. 103(3): 738-46. Pesta DH, Samuel VT. A high-protein diet for reducing body fat: mechanisms and possible caveats. Nutr Metab. 2014. 11: 53.